At the higher end of electronic cigarette brands, Vapor Couture offers the right balance between style and substance thanks to their elegant line of e-cigs. Vapor Couture brings a taste of class along with plenty of fashionable items geared for women. Style, fashion and form are all integrated into a singular e-cig that produces a high quality vaping experience. With a softer and well balanced throat hit with each puff, Vapor Couture crafted the lady’s electronic cigarette and more, making them a unique brand among many. The Vapor Couture Starter Kits are the best way to enjoy them, but if you are hesitant, you can always try Vapor Couture Disposables first. The single use e-cigarettes offer an easy way to try out the flavors. Read the full Vapor Couture review to learn more on the full line. The Entrée Kit offers those who have yet to experience Vapor Culture a way to sample what they have to offer without having to make a large payment. Considering the emphasis on quality, this is a very economical way to start and it can provide a means to customize or move up to a larger starter kit. In the Entrée Kit, you get your choice of three flavors which include Rich Rodeo Drive, Sweet Passion Fruit and Cool Arctic Mint with corresponding colors of deep purple, and rose gold and brushed platinum respectively. Vapor Couture also limits the Entrée Kit kit at 1.2% or 12mg nicotine volume. Vapor Couture’s L’Essentiel Kit offers full customization with 4 different battery styles to pick from, including 2 rechargeable batters and 2 packs of 5 cartridges in the flavor and nicotine strength of your choice. 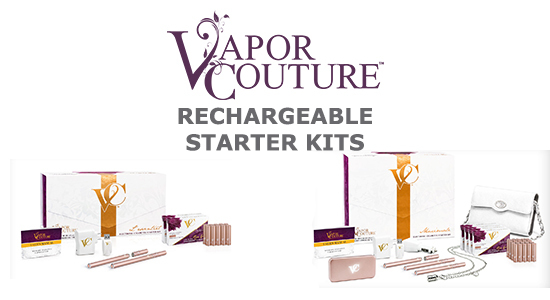 The Vapor Couture charger kit includes both a wall adapter and a USB charger for full convenience. Overall a good valued kit for those wanting to pick and choose from all the color style and flavor choices while being well equipped for full days of vaping. Vapor Couture’s L’Essentiel +1 Kit is identical to L’Essentiel Kit with the addition of picking 1 out of 2 offered accessories. You can pick from a portable charging case or a stainless steel charm necklace. The charging case can charge your battery up to 6 times while carrying an extra battery and two flavor cartridges. It has a slim design, comes available in 3 finishes and features power indicator lights. The charm necklace doubles up as a fashionable accessory while carrying your e-cigarette with a screw-on support. It can also double as a bracelet with two attaching clasps. The charm will have you styling all while serving a purpose in a clever way. We would suggest the slim charging case as it regularly sells for $10 more, but both items are discounted with this kit. This particular starter kit not only includes everything you need for the day, but also for a trip or extended vacation as well. Essentially, this is an upgraded starter kit that will ensure you have your batteries charged on the go, a car charger while on the road and you still get the charm necklace, to keep your Vapor Couture e-cigarette snugly attached around your neck while adding a touch of glam to your outfit. For the cost, this is one of the best valued Kits you get can purchase. For someone looking for the extras, this is the kit for you. This is the ultimate starting kit from Vapor Couture as it provides all the essentials while adding a few more products to make this the best experience possible. The right balance of fashion and function, the Maximale Kit has all you need to start vaping in vogue. With 3 batteries and 4 packs of cartridges, you get to pick many styles and flavors. The stainless steel necklace jewelry that doubles as a bracelet is accompanied by a Vapor Couture clutch bag for easy carrying of your charging case and accessories. This kit has it all to satisfy your hunger for style and function.